Lessons are 2 hours long with 2 pupils per instructor (occasionally 3 at peak demand, only if riding is good enough though), bike-to-bike radio, debrief and post lesson discussion on what to do next. One customer will not be on the "lead" bike for the entire lesson, but the instructor's comments can be heard by the other pupil and we believe customers not only gain knowledge from the instructor but by observing other riders' actions as well as thinking about and planning their own. 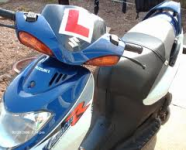 To see a how a moped or automatic scooter licence is obtained click here.